"Mom, you're beautiful." 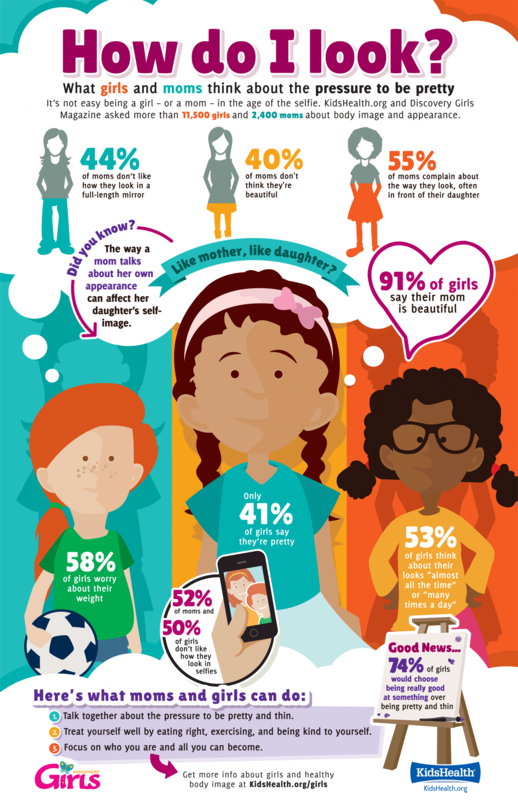 That's what the vast majority — about 90% — of girls surveyed by KidsHealth had to say about their mothers. And the feeling is mutual: Just about as many moms tell their girls that they're beautiful. On the flipside, though, only 41% of girls would call themselves "pretty" or "beautiful." Among moms, 60% say they're beautiful and 40% say they're not. More than half of moms say they've criticized their own appearance, many in front of their daughters. Of those who were self-critical, 76% said they complained out loud that they needed to lose weight. And roughly 50% of both moms and daughters don't like the way they look in a selfie. In the KidsHealth survey, we heard from 2,400 moms and 11,500 daughters, many of whom had mixed feelings about the way they look. Finding so many similarities between how they view themselves makes you wonder: Like mother, like daughter? "A mother's self-image greatly influences how her daughter views herself," says D'Arcy Lyness, PhD, a child and adolescent psychologist and behavioral health editor at KidsHealth. In the survey, many girls reported worrying about their looks a lot throughout the day, sometimes "constantly." "All that concern over looks erodes a girl's self-esteem," Dr. Lyness says. "When girls are hard on themselves about how they look, it makes it difficult for them to love and accept themselves — and this prevents them from being and doing their best." If you want to help improve your daughter's outlook, start with your own. Avoid criticizing how you look or how others look. Treat yourself well by eating right, exercising, and taking it easy on yourself. No one can live up to that unattainable image of beauty that many of us hold — but all of us can strive to feel mostly good about our looks most of the time. Talk about it. Talk to your daughter about the pressure to be pretty and thin. If there's something you or she would like to improve upon on the outside, find healthy ways of making that happen. Doing yoga or running together aren't just great ways to stay fit — they also can help strengthen that mother–daughter bond. Take pride in your appearance — but not too much. Show your daughter that it feels good to take care of yourself, but also emphasize the deeper qualities about a person that matter more. Don't make negative comments. Focus on the positive things about your looks and your daughter's looks. Instead of griping about how big your legs are, talk about how they're strong enough to help you run a 5K. Love your body — and your daughter will love hers, too! Tell her she's pretty, but also talented. Let her know you think she's beautiful, but also compliment her on the things she's good at and enjoys. Saying things like, "You have a beautiful singing voice" or "Great endurance out on the field!" will help build your daughter's confidence and convince her that she can do great things. When girls (and moms) don't put too much focus on their looks, they can enjoy the more important parts of life that really count.